Kate Winslet was in New York last week shooting Mildred Pierce, an HBO miniseries adapted from James M. Cain’s 1941 novel. Winslet is getting her Joan Crawford on, playing the title character, a tortured single mother struggling to provide for her family and break through to her unthankful daughter in Depression-era L.A. Well, that doesn’t sound fun at all! You know what is, though? 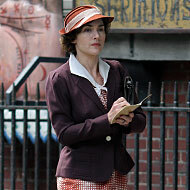 Photos of Winslet in well-tailored period dress from the Mildred Pierce set. Click through for a sneak peek.